The City of Kalgoorlie-Boulder went to tender for the installation of a solar PV system for their recreation centre building. Solargain were chosen out of approximately fifteen respondents. The main reasons Solargain were chosen were due to the company’s localised support, proven experience and full service delivery. The 137.5kW system comprises 550 x Suntech 250W panels and 9 x SMA 15kW inverters. The system was installed on time and on budget. As a result of the success of Solargain’s dealings with the City they have now also commissioned Solargain to assist with further projects. A key requirement of the job was to deliver the project safely and to industry standards, while allowing the facility to remain open. The public facility has a curved roof and it was imperative that maintenance of safety for the installation staff and also patrons using the facility was in place while installation was underway. Solargain’s safety procedures include carrying out JSA’s for each part of the installation process. The installation team was harnessed and all standards were adhered to enabling Solargain to satisfy their requirements as an ISO 9001 certified company. 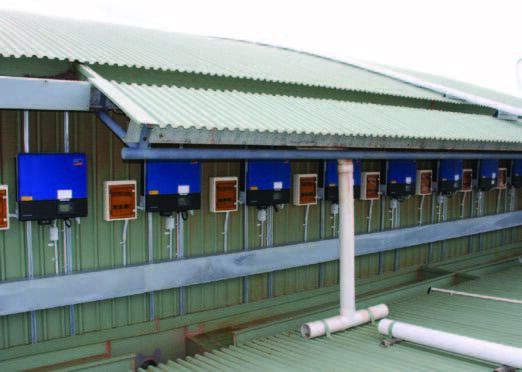 At the time of installation the 137.5kW system was the largest solar PV system deployed by any regional Shire council. The system includes a data monitoring display screen installed in the main foyer showing electrical output and carbon abatement as well as a diagnostic tool for the council on the systems performance. “Solargain PV Pty Ltd, under its Commercial Projects Manager, Craig Savill, recently completed the installation of a 130kw solar PV system on the roof of the Goldfields Oasis Leisure Centre, in Kalgoorlie-Boulder.